It’s a holiday, eat whatever you want? Nope. I made the mistake of looking at Instagram. I had posted a fun article I wrote for Just Bobbi. 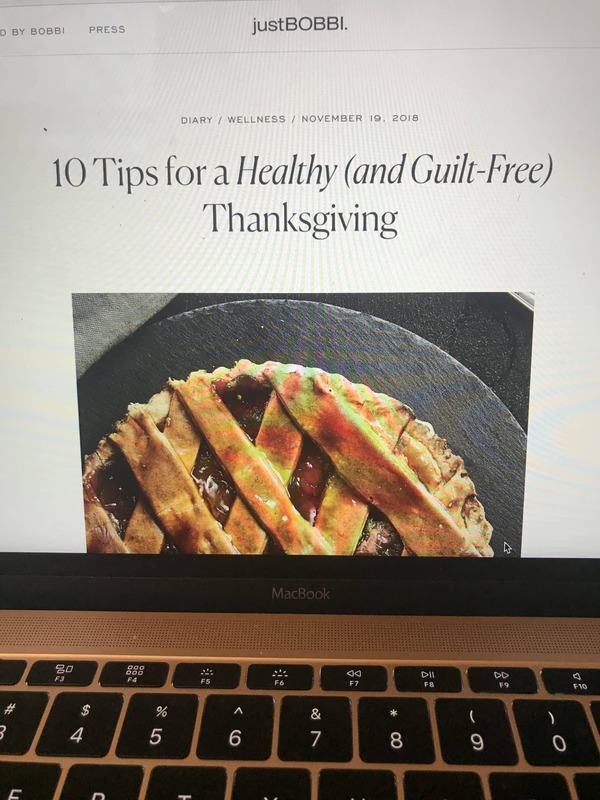 They asked me to write a “listicle” with Thanksgiving advice, from a nutritionist. 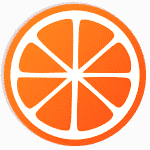 If you follow Foodtrainers, the article is right in line with our tone. It’s all about planning: how to time your day, what to bring on a travel day, encouragement to pick your favorite treats etc. This was a comment under the post. I took down the post, not because I didn’t stand by every word but because I didn’t want to debate. If I know one thing about holiday eating, it’s that, “it’s only 1 day, no rules” approach leaves me, and most people, feeling pretty ick. We find, a little strategy is not only stress relieving but also allows you to enjoy your holiday, without guilt or negativity. There is nothing wrong with saying, “I’m going to have the pie but skip other desserts.” That’s rational and healthy. Whenever anyone asks about the approach at Foodtrainers, we say it’s a lighthearted approach to wellness. 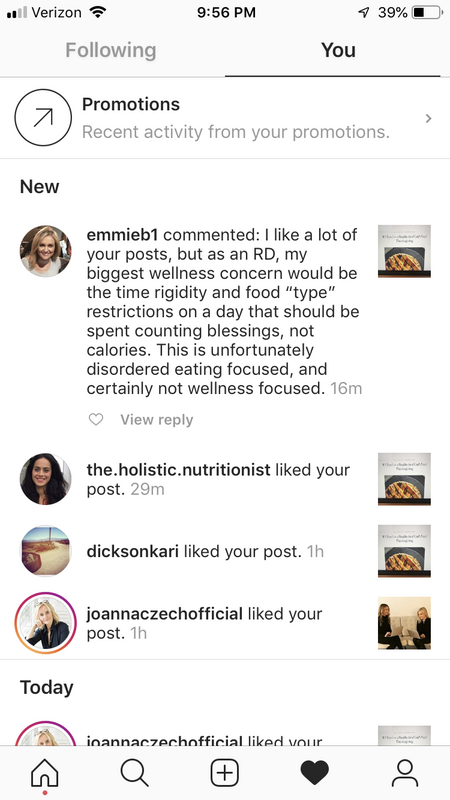 And here’s the thing, if you read my advice to bring a healthy side dish, add in some activity and incorporate a healthy ritual, and it doesn’t work for you, move on. The reason I’m writing this is because there is an aspect of the “eat what you want, listen to your body” rhetoric that sounds good. For the record, eating what you want, for me, would involve a cheese plate and a martini, before sitting down to eat. I’d move on to turkey and veg with cranberry sauce, sweet potatoes with marshmallows and stuffing? Yum. I’m not such a dessert person, but since I’ve already had a martini and enough wine tune out family dynamics, I’ll have pecan pie, and is there egg nog? I like that too. That’s my, holidays shouldn’t have rules menu. Is that wellness? Nope, that’s reflux or flatulence, digestive regret. This notion that we have to either “count our blessings” or be mindful about food is ludicrous. Guess what Emmieb1, with the private account, you can do both and we do! We’re all about self-care and affirmations, our goal is to make clients/readers/followers feel better, in all ways. I think we both agree that guilt and shame and self-loathing isn’t good. Carolyn is in Australia but she texted me, “You should have kept the post up. Without structure, many people binge, most of the post was about additive items.” I went to another commenter’s page, who had said something like “on holidays eat whatever appeals to you”. She had a “having a second plate doesn’t make you a bad person” quote posted. Nope, of course not, having a second plate makes you bloated. Trolling other people’s Instagram, while advising them to count blessings makes you a bad person (kidding, sort of). Do what makes YOU feel good on Thanksgiving. And we have some Black Friday excitement, so look out for that. BTW, I’m thankful for Carolyn and Grace, thankful for our clients and followers and thankful for humor.